A few years ago, I happened upon a little show on the BBC iPlayer when I was bored. That show was called “The Chaser’s War on Everything”. If you’ve never seen it, The Chaser’s War is a stunt and sketch comedy series by an Australian comedy toupee. They skewer the modern world – entertainment, politics and so on. It’s a great show and Australia’s National Broadcaster (The OTHER ABC) is rightly proud of The Chaser’s work. The BBC showed it here in the UK and I can only imagine they did so with envious eyes, because BBC Three’s latest comedy show “The Revolution Will Be Televised” is a fairly direct clone. BBC Three, which bills itself as “Never Afraid to Try New Things” has a recent history of trotting out all-new comedy series. Some of these are frankly brilliant, like the puppet-based adult sitcom “Mongrels”. Unfortunately, they cancelled that show. Others among these BBC Three Comedy experiments are less funny. Like everything they have done involving Russell Kane – a man whose comedy I have yet to find a single person admitting to enjoying. Unfortunately, “The Revolution Will Be Televised” appears to have come from the same BBC Three programmers who cancelled “Mongrels” and have been pushing Russell Kane harder than a Sixth Form Tutor pushes University applications and not from the people responsible for putting shows like “Mongrels”, “Bad Education” and “Wilfred” on BBC Three’s airtime. Because it’s painfully flawed. More accurately, almost all the stunts have some good ideas and funny bits in them (The exceptions from Episode 1 wold be the MI6 stunt – which was just utterly moronic from the moment it started to the moment it mercifully ended – and the Occupy Protests stunt – which took a good idea for a stunt and wasted it by having an unfunny halfwit try and do what “The Daily Show” correspondents have been doing successfully for years and failing miserably). The problem is…These guys just don’t seem to know when they’ve got the laugh. Once you’ve got the laugh, you stop. And you move on. To keep things fresh. Here, our would-be revolutionaries continue labouring the point well past the time the shock value wears off. The Chaser never did that. If the laugh came earlier than they were expecting, they simply escalated. That kept things fresh and replaced the shock value with refuge in audacity. What’s worse though, is that most of these bits were repeated. Oh yes, not content to outstay their welcome alone, several of the episode’s stunts were broken up into chunks. Meaning that we were treated to a re-tread of the same joke later in the episode – a joke which had already been overused before the re-tread even started. Frustrating to say the least. 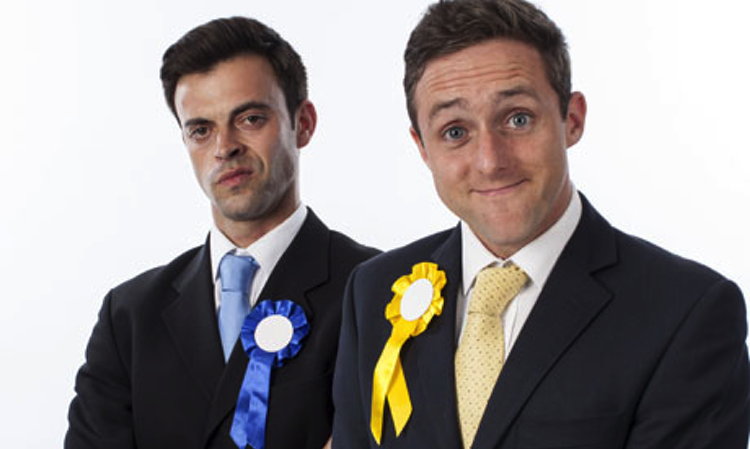 There’s something funny to be done with the ideas behind “The Revolution Will Be Televised”, but I’m not entirely confident that Heydon Prowse and Jolyon Rubinstein are the right people to execute on it- at least, not on their own. I feel like with more than just the two creators putting stunts together and carrying them out, the’d be able to cover more ground. That’d really help a lot. Still, maybe things will pick up with the later episodes. It happened for Ten O’Clock Live Season 2 after all.